Take in breathtaking views as you cruise along the Na Pali Coast on a spacious 65? catamarans for this dinner tour. Enjoy sodas, juices, water and snacks as you explore the coastline while the crew keeps you entertained with local stories about the sights on the way. The afternoon lighting is unforgettable as it streams into the valleys of the Na Pali Coast and dont miss out on a Titanic photo opportunity. A delicious luau-style buffet dinner complete with beer, wine and Mai Tais is served as you sail back toward Port Allen. Your tour finishes with the beauty of the Kauai sun sinking into the ocean along with a champagne toast at sunset. Snorkeling is not offered on this tour. See areas where no one has ever set foot. Hidden places that can only be discovered from the air. Your tour will also include many famous areas that have made the "Garden Island" a favorite location for Hollywood. On this Kauai helicopter tour adventure you will see lush valleys dotted with waterfalls, colorful and intricate Waimea Canyon and the impenetrable NaPali coast known for its towering razor sharp cliffs, secluded beaches and much more. Weight & Size Guidelines: Helicopter weight and balance changes with every flight because of passenger weight, pilot weight and length of flight (fuel weight). It is important that we have accurate body weight from every passenger. FAA regulations require all passengers and their carry-on items to be weighed at time of check-in. If a standard airline seat belt is too small or you weigh over 240 pounds you may be required to purchase a comfort seat on our FX STAR. If you are between 240-290 lbs. we recommend open seating on the Whisper STAR. Over 290 lbs. may require a comfort seat in the Whisper STAR. Everyone should experience a helicopter tour at least once in a lifetime. We believe there is no better place than Kauai because so much of this magnificent island can only be viewed from the air. Over 80% of our diverse terrain is inaccessible making the helicopter the best way to see our spectacular waterfalls, canyons, mountains, valleys, rain forests and secluded beaches. All of us are concerned about the ecology of our islands. A helicopter tour is the most ecologically friendly way to show our visitors the islands without destroying their natural beauty. For the first time ever, visitors can now land at Manawaiopuna Falls and feel the awesome power of the waterfall made famous in Steven Spielbergs blockbuster movie, Jurassic Park. This elite tour is a 75-85 minutes in duration and includes a circle island tour of the entire island with sites including The Na Pali Coast, Waimea Canyon, Olokele Canyon, Hanalei Bay and Princeville. Location: Lihue - Click here for directions. 250 pound limit per passenger and/or 445 combined for two. Otherwise additional seat must be purchased. Only one lap child will be permitted on each flight. In the event that there is more than one lap child, the couple or couples must be split in separate helicopters or charter the helicopter. Explore the unreachable beauty that is Kauai. You will see the Na Pali Coast, Waimea Canyon, Wailua Falls, Mount Waialeale while learning about the legends and history of the island that our pilots call home. Details of what you will see on this tour: Tour Waimea Canyon, dubbed by Mark Twain as the " Grand Canyon of the South Pacific." Although Mark Twain never visited the island, he must have seen enough of it to judge the unparalleled grandeur of this famous Kauai landmark. It is truly a spectacular sight. Mount Waialeale is known as the wettest spot on earth with an average annual rainfall of about forty feet. Most of the mountain rain drains into the nearby Alakai Swamp, home to several rare species of plants and birds. The legendary Na Pali Coast, with its dramatic cliffs chisled by time to a razor sharp beckoning, is spellbinding no matter how many times you see it. This is the home of the legendary Bali Hai as seen in the 20th Century Fox movie, South Pacific and yes, it is calling you. Weight & Size Guidelines: Helicopter weight and balance changes with every flight because of passenger weight, pilot weight and length of flight (fuel weight). It is important that we have accurate body weight from every passenger. FAA regulations require all passengers and their carry-on items to be weighed at time of check-in. If a standard airline seat belt is too small or you weigh over 240 pounds you may be required to purchase a comfort seat on our FX STAR. If you are between 240-290 lbs. we recommend open seating on the whisper STAR. Over 290 lbs. may require a comfort seat in the Whisper STAR. Call our reservation number 877-747-7702 for more information. Begin your day with one of the most popular morning tours aboard a custom-built 65' catamaran. As you head up to the breathtaking Na Pali Coast the crew keeps you entertained with local stories about the sights and provides information about the variety of marine life you will see. This tour guarantees dolphin sightings on all morning tours! Enjoy a delicious continental breakfast with coffee, tea, juices and sodas on the way to your snorkel and scuba destination. Once the captain reaches your snorkeling spot, its time for fun in the water! Underwater camera and wetsuit rentals are available. Snorkel, scuba dive, float on boogie boards or noodles, play on the water slide or dangle your feet in the water on our convenient swim step at the back of the boat. Scuba is offered with reservation ahead of time and no experience is required. On the way back to Port Allen the boat pull out for a panoramic view of the Na Pali Coast (perfect for photos) and have a delicious and plentiful deli buffet lunch complete with beer, wine and the best Mai Tais off the coast of Kauai. 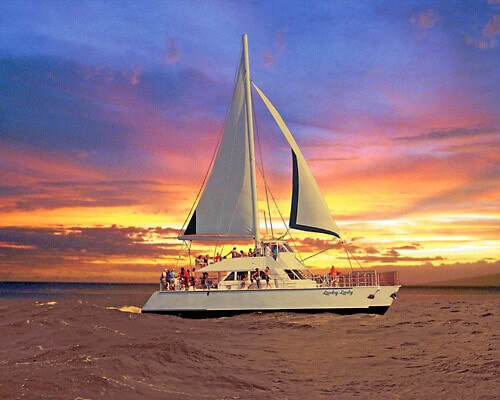 This deluxe 60-foot power sailing catamaran was designed to navigate Hawaiian waters with ease. Passengers enjoy spacious seating options, conveniently located clean restrooms & Hawaiian hospitality. Experience the majestic Na Pali coast, Kauai, on the custom-built catamaran. Snorkel (conditions permitting), view towering sea cliffs, waterfalls, sea caves, pristine beaches and remote wilderness coastline. Captains narrate Hawaiian history & legends. Encounter Spinner Dolphins, Turtles and Humpback Whale watching in season (Dec.-Apr.) Join us for the Best day of your Vacation! Snorkeling, waterslide fun, swim platform, spacious main deck and observation deck. Two restrooms, fresh water showers. The most significant celebration in Hawaii is a lu'au, held in ancient Hawaii to honor Kings, Gods, and honored guests. The Grand Hyatt Kaua'i welcomes both malihini (newcomers) and kama'aina (long time residents) to join us for this exciting island tradition under Kaua'i stars. The twice-weekly extravaganza has been welcoming guests since 2007 and is the state’s only luau show performed “in-the-round,” offering great views from every seat in the house. Featuring a state-of-the-art media system and an interactive stage design, the show includes a cast of approximately 50 dancers and musicians including an award-winning fire knife dancer. The cultural journey begins with craft demonstrations and Hawaiian games, followed by the traditional imu ceremony. Guests are treated to a sumptuous buffet, while hula dancers and musicians entertain. Following dinner, the 45-minute main show begins as dancers take the stage to share the ancient Hawaiian legend of Kalamaku (child of the new land) and the Polynesians’ amazing and dangerous journey from Tahiti to Kauai. 8:15 – 8:30pm Photo session with our cast! Served between 6:30 and 7:30, the buffet dinner includes tastes of the islands, including local favorites (lomi lomi salmon, poi and kalua pork baked in the imu), Asian-inspired cuisine (island vegetables with Thai curry and Chinese-style steamed mahi mahi), fresh salads and fruits, and an array of desserts including warm rice pudding with rum sauce and kauai coffee cheesecake. This exciting beachside lu'au take guests on a journey through Polynesia from Hawaii to New Zealand, with dances ranging from heart-racing fire dances, a stirring performance depicting the story of the fire goddess Pele and her lover Lohi‘au, to a light-hearted number paying tribute to paniolo, or Hawaiian cowboys. Complimenting the cultural journey is the lu'au’s culinary offerings of traditional Hawaiian cuisine. An array of pupus (appetizers), salads and an assortment of poke start the meal, followed by traditional lau lau, kalua pork, Kaua‘i i‘a (fish), grilled i‘o marinated beef and island guava rub “Moa” chicken. Desserts abound, adding a sweet ending to the evening. Replenishable beverages, including a selection of wines, beers, cocktails, soft drinks, coffee and tea are also included in the ticket price. * *Schedule starts 15 minutes earlier during the months of November through February. The torches are lit, the night is filled with music, and family members gather to bring you a casual, relaxing and romantic Hawaiian luau dining experience that starts off with the Imu Ceremony - the unearthing of the traditional pig, cooked to perfection in an underground oven...A scrumptious dinner, and thirst-quenching tropical cocktails are served inside the luau hale. The luau meal features traditional luau favorites, tropical fruit, and a special Hawaiian dessert table. Hawaiian musicians serenade diners during the luau meal. Young members of the family take the stage during the entertainment, and even invite guests up on stage for a hula lesson! Mai Tais, Beer, Wine, Standard Bar, Fruit Punch, Soft Drinks. Times and Availability: Summer Only 5/20/13 - 9/7/13 Mon., Tues, Weds., Thurs., Sat. A 5 hr. deluxe half day snorkel cruise when the afternoon light brings a special magic to The Na Pali. This tour combines the thrill of snorkeling and the romance of a sunset dinner cruise. 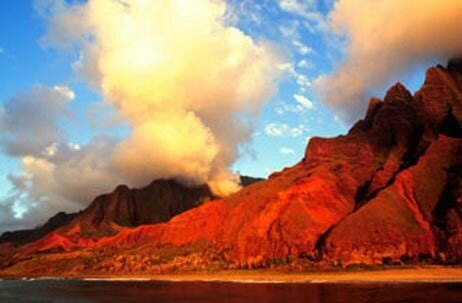 Kauai history and legends narrated and photographic opportunities of this majestic coastline. Dive in for snorkeling with tropical fish, play on our waterslide and delight to the sight of playful dolphins, sea turtles and more. Our fun loving crew serves an early dinner very casual, soft drinks, along with beer, wine, and Mai Tai's after the watersports. Lucky Lady's voyage home is complete with a romantic sunset to top off the perfect day. Come prepared for the beauty, the motion, and the ocean. We recommend beach attire and a cover up. Restrictions: Pregnant women or those with serious health concerns, recent surgery, or history of back injury are not permitted. Children must be at least 4 years old. The Na Pali coast is considered the jewel of Kauai. It’s definitely not to be missed. Unfortunately, there's no road to get there. It’s said the Na Pali Coast is the second-fastest eroding coastline in the world, so the terrain is just too crumbly to support roads. (They tried it once, decades ago—they soon gave up)! What’s fascinating is at one time large settlements of Hawaiians lived in these narrow valleys, some backed by thousand-foot cliffs with, seemingly, no access overland and during Winter’s big surf, and no access by sea. Archaeological evidence of homes and he‘iau (sacred sites), as well as terraces for agricultural purposes, remain today along the entire coastline. • Pregnant women and those with chronic back and heart conditions are not permitted to particpate. Experience the majestic Na Pali coast, Kauai, on the custom built catamaran "Lucky Lady". Snorkel, sailing (conditions permitting), view towering seacliffs, waterfalls, sea caves, pristine beaches and remote wilderness coastline. Captains narrate Hawaiian history & legends. Encounter Spinner Dolphins, Turtles and Humpback Whale watching in season (Dec.-Apr.) Join us for the Best day of your Vacation! Snorkeling, waterslide fun, swim platform, spacious main deck and observation deck. Two restrooms, fresh water showers, we provide quality gear, instruction, and safety snorkel vests. Passenger safety is a top priority, this tour does not take pregnant women, those with serious health concerns, the frail, those with bad backs or previous spinal injuries on any of our ocean tours. Children must be over the age of 3 years old. Departure Location: Check in at the Quicksilver Store in Hanalei 30 minutes prior to your lesson time. Staff photographer is available to take photos for an additional charge. South shore surfing lessons - private lessons are available! The Aloha Surf School is an excellent choice to choose for your surf lesson because the majority of their instructors are currently or have been in the past, on the professional surf circuit. My experience has been that not only are they excellent surfers in their own right but that they are able to translate the "how to" part of the skills to their clients. These lessons are generally taught in the Poipu area in a spot just perfect for beginners where there seems to always be enough of a gentle swell to propel the novice surfer to the shoreline. As a result of their excellent instruction most beginners are able to stand up during their first session and feel like a champ. Those eager to become "one with the water" can receive undivided guidance and attention in a private lesson. During the session, your instructor addresses personal needs, trouble spots, and the merging of form and movement. Book this tour for an exciting tour you will long remember. Mt. Waialeale, at the center of Kauai, is the wettest place on earth. Location: Tours depart from convenient meeting locations. This half day adventure combines four wheel drive access and hiking to give you an unparalleled experience. From convenient departure locations, our expert guides will lead you to the heart of Kauai. Heading inland from Wailua on Kuamoo Road (580) past Opaekaa Falls and the Wailua Reservoir to the Keahua Arboretum. From the Arboretum, fasten your seat belts because we are going on a bumpy ride, further into the heart of Kauai. The trail crosses streams and winds through the dense forest to the, "Gate", used in Jurassic Park. We will park at the gate and have an easy half hour stroll past wild flowers and gorgeous vistas to the source, where water is diverted into the irrigation system of Lihue Plantation. Restrictions: There is a total of about 3 miles of walking involved in this tour. The trail is not difficult but between the bumpy roads and the walking, this tour is not recommended for people with neck or back problems, people prone to motion sickness or who are not at least moderately fit. Choose one of two daily ATV expeditions through the gorgeous mountains of Kauai's south side for an unforgettable experience of the road less traveled. Ride your own ATV through 22,000 acres of private dirt roads and trails. Enjoy breathtaking mountain and coastline views, unspoiled tropical landscapes inaccessible to the general public, and a half mile tunnel through the heart of Ha'upu mountain range. An adventure filled 3 hour ATV tour, (2.5 of riding), tour through a working plantation. Explore famous movie sites, beautiful Mauka and Makai vistas and a historic cane tunnel. Learn about Kauai's plant and animal life from knowledgeable guides. Highlights include shoreline views of Hawaii's largest inland body of water, The Wita Reservoir. Mud Bug - The MUD BUGS are perfect for those who just can't bear to be apart (yes, we take a lot of newlyweds). MUD BUGS are fully automatic off-road vehicles that guests drive. MUD BUGS feature a 3-point harness system, roll bars, and a Baja tested suspension system. Ohana Bug - Perfect for the family! A bigger version of the Mud Bug, the Ohana Bug seats a family of 4 comfortably! Be prepared to get dirty, even in the back row. Mud Bunny- These fully automatic All Terrain Vehicles are simple to operate and fun to ride. Never been on an ATV? No worries! We specialize in "first timers" with complete riding and safety instructions before every tour. • Must be 16 with ID to drive any vehicle. ID must indicate birth date. Guests 18 and under must be accompanied by an adult upon check-in. Children 5 and up may ride as passengers in the mud bug or ohana bug. No persons under 16 years of age are allowed to drive. Full use of arms and legs required to drive an ATV. No persons with back problems or recent surgeries. No pregnant women. Weight restrictions are, 320 for MUDBUGS, 250 for POLARI'S ATV'S. Long pants and closed-toe shoes required! Just Live, Inc. is an adventure and training company specializing in zipline tours and team building services for visitors, corporations, youth and community groups. Wiki Wiki Tour - 8:00am and 12:30pm. Just Live takes pride in their superior level of customer satisfaction and service quality. Their mission is to provide unique and exciting, eco-friendly adventures that enhance the positive development of youth, businesses, community and visitors. Whether you are a visitor looking for a unique, heart-pounding zip line canopy tour, a corporate group looking for an outstanding teambuilding retreat or a school looking for effective programs for your students… Just Live, Inc. will go beyond your expectations to provide you with a meaningful and unforgettable experience. The Wikiwiki (‘quick’ in Hawaiian) Zip Tour is exciting, beautiful and a shorter version of our Zipline Treetop Tour. Enjoy 3 zipline runs and 3 bridge crossings. 2 out of the 3 zips are over 700’ long! Launching from atop old sugar cane fields you will zip past eucalyptus and bamboo landing high in an amazing Norfolk pine forest. Mountain views are incredible! Ecology narratives included. If you want a great zipline tour but don’t have much time the Wikiwiki Zip Tour is perfect. An amazing zipline canopy experience that combines zipping high above the treetops with unique and exciting bridge walks. Enjoy 7 zipline runs (up to 800’ in length!) and 5 bridge crossings as you soar through the canopy of Kauai’s silent giants, a grove of 200 foot tall Norfolk pine trees. Gliding 60 - 80 feet above the ground you will be able to experience life from a bird’s eye view. Come explore and have the ride of a lifetime. Once you are up in the trees you stay in the trees! Fly through the forest over pine, mango, eucalyptus, bamboo, and native plant and bird life. Mountain views are outstanding! Ecology narratives included. This thrilling and impressive tree top tour is sure to be etched in your memory forever. 3 Ziplines! 3 Bridges! Rappelling! Monster Swing! Rock Wall Climbing! Kauai’s most unique and thrilling eco-adventure tour is packed with adventure and adrenaline. The Zipline Eco-Adventure combines the Wikiwiki Zip Tour with 3 exhilarating activities. After the fantastic Wikiwiki Zip Tour you go Rappelling in 150’ tall Norfolk Pine trees. You can choose to rappel from a 50’ platform or a 100’ platform! Get ready for the ride of your life on our 60’ Monster Swing and conquer the 60’ Rock Climbing Wall. All of this while enjoying the beauty and magic of the forest and mountain scenery around you. If you love heart-pounding adventure this tour is for you. All activities on this adventure tour are optional. However, we encourage and challenge you to embrace the adventure and experience them all. Ages 9 & up, 70 – 250 lbs weight limit for all zipline tours, Guests must be in good physical condition and possess some upper body strength, No pregnancies or heart conditions. No neck, back, hip, knee, ankle or foot injuries or conditions. All participants must safely have the ability to perform the following actions without putting themselves, and/or other participants and/or guides, at risk of injury: Run up ramps at the end of every zipline. Cross canopy suspension bridges 60 - 80 feet above the ground, Ascend a 38 foot ladder climb and Ascend a 75 foot suspension access ramp. Zipline 9 lines and swim in hidden swimming hole! This course is a thrilling combination of nine picturesque zip lines and a suspension bridge spanning a waterfall. Imagine walking off the edge of a lush valley, flying over tree tops to the other side and soaking in gorgeous mountain views along the way. The final zip line—called “King Kong”—is an adventure all on its own! First you walk up a ramp to a 26-foot high tower. Next you zip 1,200 feet across one of the stunning valleys on Princeville Ranch. You can race your partner side-by-side (or even hold hands)! And of all Kauai adventures, only the zip tours on Princeville Ranch offer action photography. Take your memories with you, as photo prints or a souvenir USB stick! This famous zipline adventures tour includes an hour at a deep, hidden swimming hole, fed by a small waterfall. Here you’ll enjoy a delicious picnic, swimming, jumping and floating on inner tubes. Hiking is rated moderate and is just over one mile. 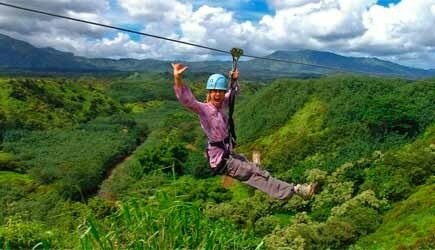 If you’re looking for the best in Kauai zip line adventures, check out the Zip N’ Dip! NEW – automatic action photography –the first of its kind for ziplines! Take your memories away, either as a photo print or on a USB stick. You can also rent GoPro video cameras! Weight between 75 and 280 pounds. Children age 10-15 must be accompanied on tour by an adult guest who is at least 18 years old. Zooming! X-Zilerating! Zipping! Traverse a tropical mountainside on our 7 zipline course! Imagine the thrill of soaring and flying like a bird over a pristine rain forest! At Kauai Backcountry Adventures, you can “get high” on this exhilarating experience! Fly across seven ziplines which descend a mountain side. Feel the rush as you glide over lush tropical forests and deep valleys below. 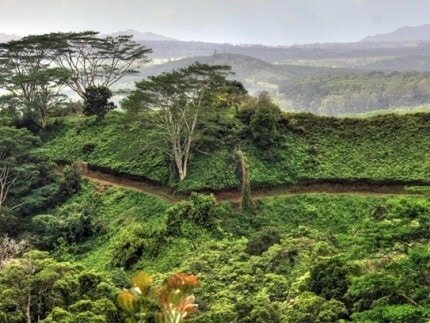 With exclusive access to over 17,000 acres of former plantation lands, Kauai Backcountry can offer you a truly one-of-a-kind experience. You will begin with a fun and informative scenic ride in a four wheel drive adventure vehicle. Along the way, your certified guide will share interesting information on island history, culture, flora and fauna. When you arrive at the first zipline, you’ll receive a thorough briefing, preparing you to soar over tropical forests, streams and jungles rich with magnificent scenery! You’ll zoom down the mountainside, sailing along on a series of seven ziplines, as you make your way to the valley floor below. End your zip with a delicious picnic lunch in a bamboo grove and a refreshing swim. Relax, bask in the sun, or just soak in our natural swimming pool. Take one last dip in the water before heading back to home base! Truly an incredible journey which will leave you with vacation memories of a lifetime.. Weight: 100-250 pounds. All guests will weigh-in at check-in. Those outside the 100-250 pounds range will not be able to participate and will be responsible for full fare. Paddle the majestic Wailua River, original home of the first Hawaiians, who paddled 1500 miles from the Marquesas Islands to Kaua`i almost 1500 years ago. 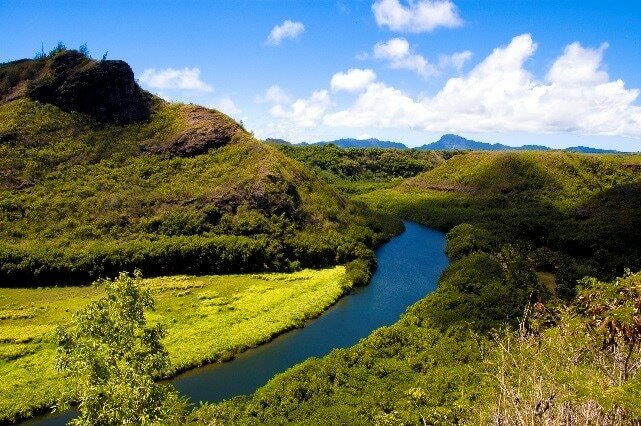 Hear the legends and learn about the flora and fauna of Kauai`s most sacred area. After paddling past numerous Heiaus (hallowed shrines), you will view ancient Kamokila Village. Soon you will come to the North Fork where you will paddle leisurely through the Garden Isle's most beautiful jungle river until you come to the trail head for Secret Falls. Enjoy a moderate hike through Kauai rainforest to an enchanting waterfall, which descends 80` into a natural pool surrounded by rocks and vegetation - made famous when it was featured in the opening scene of the popular television show, Fantasy Island. • A delicious picnic lunch. Customers may choose turkey, ham, or vegetarian sandwich. Beverages are provided. •Participants should be comfortable in the water, enjoy hiking and be in good physical condition. Expect about 4 miles of paddling and just over one mile of hiking. Trail conditions can be muddy and slippery at times. • No bad knees, or bad backs. • Must be able to walk 1.5 miles & kayak 60-90 minutes. 3 hour Guided Paddle and Snorkel Tour of the Hanalei Heritage River and Bay. A three-hour guided tour along the scenic Hanalei River and Bay Reef Lagoon accompanied by charming water-borne natural historians. Safe family enjoyment with the land, water, fauna and flora genuinely interpreted. Highlights are views of Bali Hai (Makana Peak), and the sweeping South Pacific panorama. Bird and turtle watch, snorkel for views of colorful reef fish. Wade by a sandy beach. The more adventurous can paddle out in a surf kayak. Come frolic with us in these calm, clear, shallow waters. • Guide(s) State certified and trained in water safety. • Personal Flotation Devices (PFD's) i.e. life preservers. Physical Requirments: This tour is very relaxing and safe. Participants should be comfortable in the water. Perfect for all ages, couples, and families. Join this tour for this exhilarating half-day ride in the stunning Waimea Canyon that's all downhill and totally uplifting. Saddle up and give your pedals a few cranks, we'll start at 3,600 feet and then it's a safe ride down to sea level, stopping to marvel at the dramatic canyon cliffs and dazzling Pacific. Definitely the best views you can get, without even breaking a sweat. Enjoy refreshments and information about the fascinating culture, history and folklore of Kauai. Think of it as kind of like a nature walk, but on a bike. It's an adventure that you'll always think of as uplifting even though it's downhill. There are morning and afternoon tours daily. The bikes provided are great single-speed cruisers with wide, comfy saddles, hi-rise handlebars, disc brakes- fun and easy to ride. • Morning Tour: fresh-brewed Kauai Coffee and blueberry muffins hot out of the oven as you ride up in the van. • Afternoon Tour: Cold soft drinks, spring water and Kauai Cookies. All participants must possess basic bicycle riding skills. For safety reasons, no riders under 12 years old, or anyone weighing over 260 lbs, please.